If you can’t find pattypans, substitute sliced yellow summer squash. 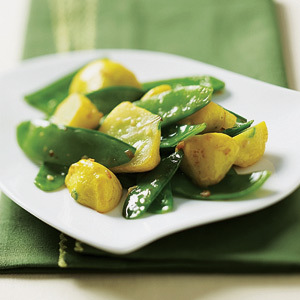 Blanch pattypans and snow peas in a saucepan of salted water for 2–3 minutes. Transfer vegetables to a bowl of ice water and chill until cold; drain. Heat oil in a skillet over medium heat. Add garlic; cook 30 seconds. Stir in pattypans and snow peas; sauté until heated through, about 4 minutes. Season with salt.